GET FREE TEACHING MATERIALS and our periodic newsletter with ideas to help bring music and American history alive for your students. The story of Francis Scott Key and the U.S. national anthem is so well known as to be all but unknown. The Star Spangled Music Foundation is dedicated to presenting the latest research on the U.S. national anthem, correcting several myths about the song, and putting it in context of American History.Did you know that there were more than 80 songs written to the same melody before Key wrote his lyric “In Defense of Fort McHenry,” which became “The Star Spangled Banner”? Did you know that there have been parody lyrics since Key’s day arguing for the abolition of slavery or the election of presidential candidates? Our teaching materials will provide the unknown story of Key’s anthem for you and your students. 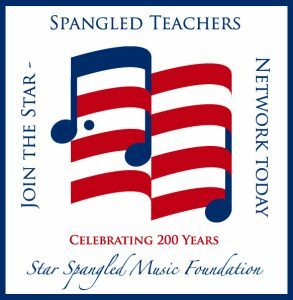 A goal of the Star Spangled Music Foundation is to build a national network of passionate teachers who want to share “The Star-Spangled Banner” with their students as part of the anthem’s bicentennial celebration (and beyond)! We will send periodic email updates to Network members to let you know about the best websites to get information about American song, new instructional resources, and important events that will be of interest to you and your students. (Only your email is needed and you can unsubscribe at any time. We will not share your email with others.) Thanks for joining us! Fill out the form below and click on “Subscribe.” Only your email address is required, but the other fields will help you get the information you want and help us to know more about your interests and needs. You will be redirected to the free download page as soon as you confirm your email address. How could we help you teach the Banner? Note: You will be redirected to the free download page as soon as you confirm your email address.